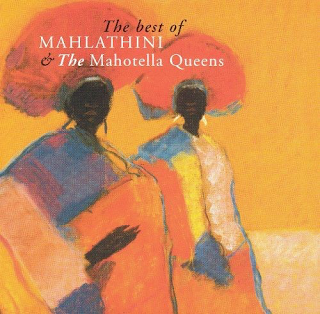 Mahlathini & The Mahotella Queens were one of the leading exponents of the South African townships' mbaqanga style of music. It has its roots in Zulu culture and blends tribal call and response backing vocals, tribal insistent drum grooves with Western instruments such as bass guitar and punchy brass sounds Of course, some lilting South African-style electric guitar comes into it too. "Mbqanga" is a type of cornmeal porridge so the music is like the "daily bread" of township life. A bit like roots reggae in Jamaica. Simon "Mahlathini" Nkabinde had probably the most famous voice. He was known as "The Groaner" due to his gruff, growling vocal style. 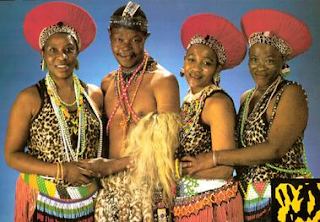 The closest artist I can think of to compare him to is reggae's "toaster " vocalist/DJ Prince Far I. Mahlathini sings/growls/croaks his vocals over an infectious beat like a preacher, while the melodious stuff is provided by the exhilarating backing vocals of the Mahotella Queens. "Madlamini" is a bassy thumper that exemplifies the heavy, rhythmic side of their music, while the impossibly infectious, uplifting, sheer joy of "Lilizela Mlilezeli" will ensure you don't sit still. It's bloomin' marvellous. "I'm In Love With A Rastaman" explores the South African love for reggae (personified in their main reggae artist, Lucky Dube), with a gentle skank given that unique township feel. The refrain is pure Lucky Dube. Flutes kick in, brass, skanking guitars, Mahlathini's growl, the wailing Queens. It is as if you are at a Zulu wedding. Great stuff. Just listen to "Jive Motella" or the shuffling "Makhomabhaji", with its killer organ solo, if you want your spirits lifting. Indeed, put any of this album on at any time and it will get you going. When township musicians hit that lilting groove, it is the music of the Gods. Need any more proof? Try "Sengikala Ngiyabaleka" and its intoxicating saxophone riff and that typically township, rumbling bass line. PS the Deezer sample below is the only one I could find, most of the tracks are the same.